Hey, Sky? You do know that the same Google Play Store listing can be used for both smartphone and tablet versions of an app, right? No? You're still going with separate smartphone and tablet apps, like it's 2010? Okay then. 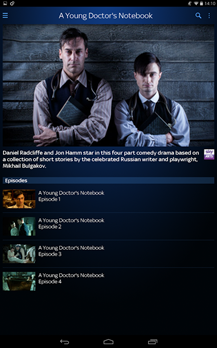 The Sky Go tablet app has the same basic features of the smartphone app, but it's restricted to 7" or larger tablets running Android 4.0 or later. 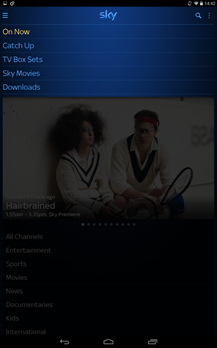 Kidding aside, the feature set of the Sky Go app is pretty admirable, with live TV and streaming TV on demand. 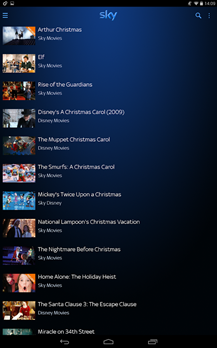 According to the app description there are "over 800 movies" and more TV shows than you can shake a sheleighly at across 11 movie channels, Sky Atlantic, Sky 1, Sky Living, Sky Arts, and Sky News, and various sports channels. Users can register two devices and there is no WiFi restriction. Subscribers to Sky Go Extra (£5 a month) get to use the app on up to four devices and get access to live TV on two at the same time, plus the ability to download movies or TV shows for offline viewing later. 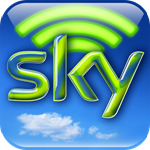 The original Sky Go app has pretty dismal reviews, seemingly stemming from serious compatibility and stability issues. Conversely, the tablet app is getting a pretty good response from initial users, currently sitting at 4.6 stars. 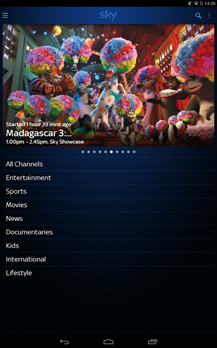 Naturally you'll need to be a subscriber to Sky's TV service to log in, but like most streaming cable apps, there's no extra charge for the basic app itself. The Sky Go app can't be downloaded outside of the UK and Ireland, and streaming video won't play outside those countries either, but you should be able to download movies or TV shows for international travel. Fair warning: this FAQ says that root users are left out in the cold, once again thanks to "contractual agreements."